The concept of “backcasting” is central to a strategic approach for sustainable development. 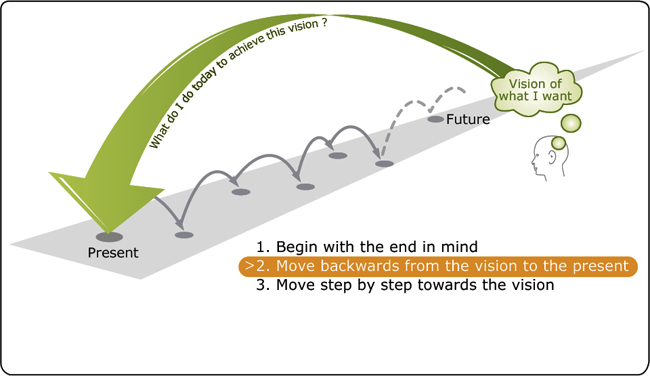 It is a way of planning in which a successful outcome is imagined in the future, followed by the question: “what do we need to do today to reach that successful outcome?” This is more effective than relying too much on forecasting, which tends to have the effect of presenting a more limited range of options, hence stifling creativity, and more important, it projects the problems of today into the future. In the context of sustainability, we can imagine an infinite number of scenarios for a sustainable society – and ‘backcasting from scenarios’ can be thought of as a jigsaw puzzle, in which we have a shared picture of where we want to go, and we put the pieces together to get there. However, getting large groups of people to agree on a desired future scenario is often all but impossible. Further, scenarios that are too specific may limit innovation, and distract our minds from the innovative, creative solutions necessary for sustainable development. So strategic sustainable development relies on ‘backcasting from sustainability principles’ – which are based in science, and represent something we can all agree on: if these principles are violated, our global society is un-sustainable. To achieve a sustainable society, we know we have to not violate those principles – we don’t know exactly what that society will look like, but we can define success on a principle level. In that way, backcasting from principles is more like chess – we don’t know exactly what success will look like, but we know the principles of checkmate – and we go about playing the game in a strategic ways, always keeping that vision of future success in mind. Natural systems are complex and non-linear, and while we understand more and more about how they behave on the principle level, we still cannot predict the weather. Social systems are far more complex. Still, we try to force these systems into models so we can ‘understand’ them and ‘predict’ how they will behave. To do this, we are forced to make assumptions that often make the models reductionist, simplistic, and absurd. For example, in economic systems the assumptions that all people are ‘rational actors’ and that there is ‘perfect information’. In large part, this is due to a tradition of compartmentalized disciplines in academia, where the social scientists have pushed a quantitative, value-neutral approach to studying these systems in the misguided pursuit of establishing concrete laws similar to the laws of nature. Even if we could predict the future, why would we want to? We have the power to create a better future. The complexity of social systems within the biosphere demands a whole-system perspective and employing backcasting from sustainability principles. In this way, we can acknowledge the value-laden reality of social systems. We can all take a transdisciplinary approach to learning to better understand the basic constraints we must operate in. And together, we can implement the dramatic change in societal design necessary to create a sustainable society.